Different it is, then. Reading last ish’s letters page clued me into the fact that Claremont was taking a break (to write some novels, even!) and that we’d be getting a new writer. Louise Simonson isn’t new to this game—she’s the scribe over at X-Factor, so I figured we’d be in good hands. So, we’ve skipped a few issues again, but with a new writer it feels different, which isn’t necessarily a bad thing. 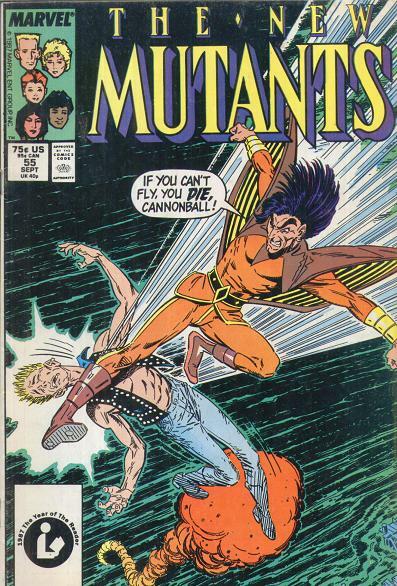 We open on the New Mutants getting ready for an album drop party of Lila’s; naturally, Cannonball and crew are doing the teenage thing and worried out of their gourds as to how they’ll look. Cannonball has to impress his love and Rhane is just plain worried that dancing in sinful because the priest that raised her told her so. There’s a little editor’s note here where they bring up this “bird-boy,” something that happened over in a limited Fallen Angels series. I’ve a few issues on reserve, so I may pick those issues up next. If you remember back in #51 Claremont said there’d be a new direction to the New Mutants. Other than the scribe, there’s a few things different, but that’s a good thing. Maybe it’s the writer that’s the ticket because it feels like a teenage book at this point. No longer are we worried about mutant acceptance, or even death, but they’re at a party where swagger (yes, they use this!) is the name of the game. This is also a nice one-in-done issue, which is very much a relief to the over-arching crossovers and build-ups that have been going on since forever. There are a few hints here that may lead to other seeds, but for the most part we’ve got something complete. Typical teenage strife: bullying, peer pressure and budding romance make this issue top-notch.